It has been quite a while since I've posted here. I spent pretty much the entire month of July traveling, first on another cross country road trip and then on a family trip to Ireland. My grandfather is from a small town in the very south of Ireland and my family and I traveled there to see where he came from. We also visited Galway and Dublin while we were there. I had never been to Ireland before and, naturally, I took a ton of pictures. I kept thinking about how gorgeous all of the colors were everywhere. Obviously there was lots of green in the landscapes, but I was a big fan of the colorful buildings, artwork, and other vignettes. 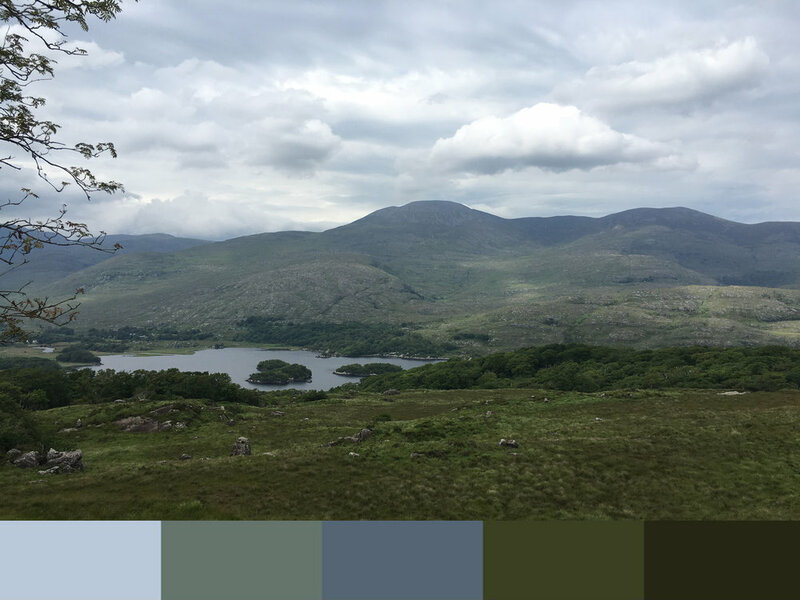 On the last morning of our trip I was up early and trying not to wake up my sister, so I spent some time on my phone, importing photos into the Adobe Capture app and creating color palettes out of them. The app is free, and picks out the dominant colors in your photos, create palettes, and add them to your Library, which you can use in other Adobe programs, like Photoshop and Illustrator. I created a bunch of palettes, and I think they look great all together and on individual projects. I thought I'd share some of the photos I took, the palettes I made from them, and the work that I made using those palettes. I loved this little salon in my grandfather's hometown. I didn't get a great photo of it, but it makes a wonderful palette. I made this little eyes pattern out of it. I love this wall and post office box combo. I loved these colorful buildings in Kenmare. This is not a palette I would ever go for on my own, but I think it looks great here, and I can't wait to try something out with it. More wonderful buildings all over the country. Of course, there were lots of landscape photos. I used just part of the forest-y palette above to make this clover pattern. The photos don't need to be travel-centric to make great palettes. I like this one of reading with a cup of tea. One tip I have is to try out photos that you're drawn to, even if you're not sure that they will make a great palette. I love this near-rainbow that came out of this photo of my lunch. Have you ever used the Adobe Capture app or something similar to make palettes? All the colors just make me so happy, and I hope they make you happy too. I'm so excited to keep playing with these palettes.